The pioneers called a room a pen. The open roofed area between the pens was called a dog trot. A small rustic house is a cabin, thus, a two-pen dog trot cabin. The oldest standing house in Hempstead dated to 1820 and was located in Penhook. It belonged to the Johnson family. I remember going through it when I was a boy. It looked like the one to the left, and had a narrow stairway to the second floor. It was moved to Washington in the early 1950's but was never reassembled - lost in the vicissitudes of time. The initial settlers, starting around 1810, first had to build a cabin, plant corn and other vegetables, and locate game. Deer were abundant and, at first, there were buffalo. Nearby rivers and Beard's Lake provided fish and in the winter ducks. Squirrels, rabbits, raccoons, and, God forbid, possums were plentiful. Next, somebody needed to operate a grist mill and a saw mill. A store would be eventually be opened for trade goods and a church would be built. The town gets plotted and lots are sold. First thing you know, somebody names the place Penhook. 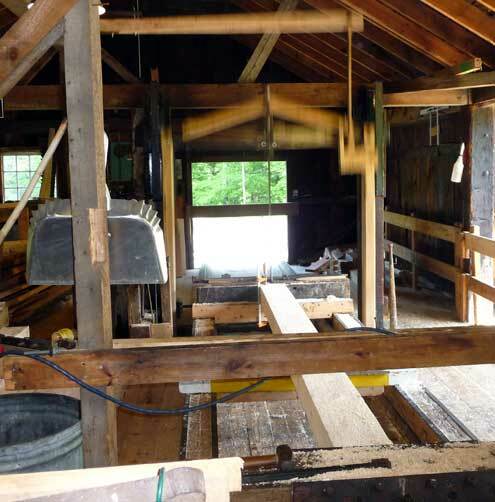 One of the first settlers in Penhook was Samuel Moren, who also set up the first grist mill. 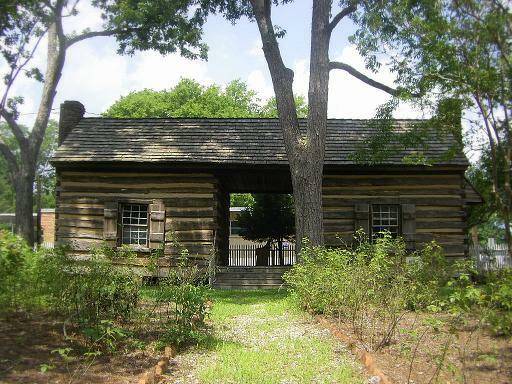 Although the early settlers built homes with logs, John Johnson put together a power driven saw mill on Mine creek. 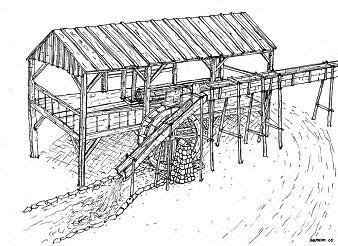 This is only a guess at what the Johnson sawmill looked like, but it probably was a simple "up and down" saw, powered by a water wheel. After the basics were met, the settlers needed a cash crop. There was a market for cotton, if you could get the stuff ginned and down to New Orleans. Upland cotton is the favorite species for Arkansas. The long length varieties are called "Long Staple Upland" and are the most widely cultivated. I hear there was a high grade sub-species know as "Hempstead County Upland". The preparation for planting cotton began soon after the fall harvest, weather permitting. Land was laid off into rows from three to four feet apart, then ridged up by throwing two furrows of a turning plow together. A trench is made in the ridge with a small shovel-plow. The seeds will be planted along the trench. It had interchangeable "sweeps" and shares for cultivating. Sometime in April the planting begins, but knowing exactly when to begin planting is difficult. One old fashion way involves the farmer sitting down on the bare ground for about five minutes, then getting up and feeling the seat of his pants. If the seat is nice and warm, begin planting. 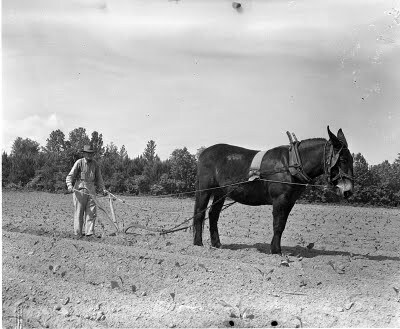 Then, workers drop the seed and are followed by man and a mule pulling a "board" which covers the seed with loose soil. 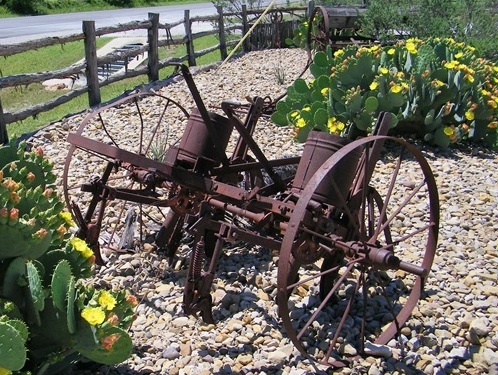 Later, a mechanical mule powered planter replaced hand planting. As the cotton seed stuck together, a continuous line of plants sprouted. . When the cotton is up and growing well, cultivation begins by throwing earth to it with a "cotton sweep" pulled by a mule. The space between the rows was plowed and pulverized and the sweep repeated. As soon as the plants are sufficiently strong, they are "chopped to a stand" so that the space between the plants measures about a foot. The hoe also cuts out any grass that is growing around the plants. Plowing and hoeing continues about every ten days until the cotton leaves are able to shade the soil and hinder grass growth. When the cotton no longer needs hoeing it is said to be "laid by." Next, the plants produce flower buds, called squares, which bloom white, then turn pink and fall to the ground, leaving behind the boll. The cotton continues to bear and bloom till frost, when the hard bolls begin to burst into snow white cotton. The steam powered Goodlet Gin was originally near Ozan, but was moved to the state park in Washington. Sometime in the 1950's I went with my uncle to have cotton ginned there. We were the only customers, as this was at the very tail end of cotton growing in Hempstead county. Grandpa Wilson had a kerosene powered gin at Penhook. It ran a few times after WWII, but was eventually closed and was torn down. Only the cement foundation for the engine remains. When the South lost the war and slavery was ended, landowners and freed slaves negotiated a new labor relationships. 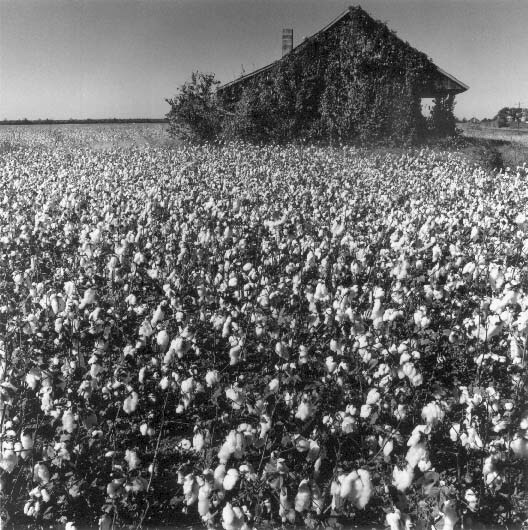 The land owners had no money and the freed slaves had few options, as banks would only loan money for cash crops, such as cotton, which could be accounted for. When Grandpa stacked arms at Jackson, Mississippi at the end of the war, he told Jonas the servant who had been with him from the Battle of Pea Ridge in north Arkansas to the siege at Fort Hudson at the mouth of the Mississippi, "You are free to go now." Jonas packed his belongings and left camp, but before dark he returned and approached Grandpa. "Can't we just leave things like they was?" After the crop was laid by in late summer, the family could earn money as day laborers, picking wild berries, and selling butter and eggs. If the labor was performed for the owner of the farm pay day was Saturday morning. The workers who were owed money might line up at the window of the owners house and he would do the calculations for each worker and hand the cash through the window. Money in hand, all of the farm families clambered onto the bed of a big truck and headed to the county seat for the day. Once in town the parents headed to the grocery store and the children to the picture show. For 12 cents you could see a double feature, a serial, and one or two cartoons. There would always be one cartoon and when it was finished and a second cartoon began a cheer would go up, but if the news of the day was next then came a big groan. Sometimes the kids would stay through two complete showing and emerged dazed from the theatre five or six hours later. In the early 1950's, the parents would purchase flour in 25 pound sacks, lard in 5 gallon cans, and syrup by the gallon. Sausage was 5 pounds for a dollar and hamburger was 4 pounds for a dollar. I worked in a meat market and grocery store and we killed our own cattle. The owner would go to the sale barn on Thursday and purchase perhaps 10 head of steers weighing about 600 each. He would load them up and haul them to the slaughter house outside the city limits. Smack would go out on Friday morning, kill, skin, quarter the beef and hang the quarters in the chiller. The following Thursday the boys that worked in the store would haul the quarters to the market and hang the meat in the cooler. By my time there was an electric saw to cut the meat and an electric grinder in the back to make hamburger. After I became the top boy, I earned 36 dollars a week in the summer for a 50 hour work week. This was good money, as a grown man at that time probably did not make much more that that working at the basket factory or the handle mill. Anyway, back to share croppers. Often the men would spend the day a the domino parlor playing a game called "Moon." About dark the customers would return to the market to pick up their groceries and meat. The cooler would be filled with packages of meat identified by names on each package and sacks of staples would be brought out form the back of the store. The provisions were piled on the truck and the exhausted families went back to the farms with the children asleep on truck bed. When the bolls opened the fields turned white and everybody turned out to pick cotton. The workers were given or provided their own long sack that looped over the shoulder. When the sack was full it was brought to the scale and weighed. A good worker might get 450 pounds or better of seed cotton in a day. But the sharp edges of the boll left his hands bloodied and carrying the full sacks to the scale left his back sore. The Cotton scale was a simple device that were hung from a tree limb. The sack was tied to the bottom of the scale and a "P", or weight, usually did the weighing and kept the records for each picker. The weight of the sack was deducted and the cotton was emptied into a wagon or truck with high side boards. When there was enough cotton in the wagon for a bale, the mule team was hitched and the load started on its way to the gin. There were many gins around, so the haul might not be more than five or six miles. The cotton was unloaded at the gin with a large vacuum tube. The tube was pulled down into the wagon and it sucked the cotton into the ginning mechanism. 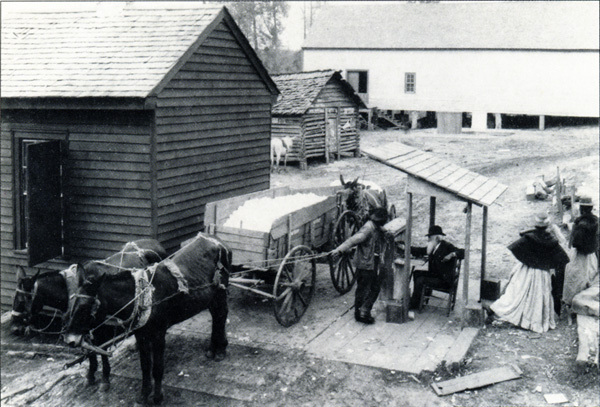 Wagons often waited in line to be unloaded. The cotton is being weighed at the gin. Notice the wagon driver is checking the reading of the scales. Most share croppers had no choice of vocations until World War II. Between 1940 and 1970 five million persons exited the South in what is know as the Second Great Migration. The First Great Migration, 1910 - 1940, involved only about 1.6 million migrants. The migrations spelled change for Penhook. To Cousin John Wilson and his wife Mary the change came in 1944. When they settled up with the ten share cropper families on the place that year only one family signed on for the next year. That evening they looked at one another and wondered out loud, "What are we going to do?" There was only one option if they wanted to stay on the farm, borrow from the bank and switch from farming with mules and tenants to tractors and paid labor. Most upland cotton farmers limped along for a lack of a better option until the 1950's when the federal government stepped in. Farmers were given an allotment based on the number of acres traditionally grown in cotton. New cotton farmers or farmers wanting to expand their cotton acreage could purchase allotments from other farmers. Cousin John and Mary sold their allotment to a man in Arizona, who could grown cotton in the desert with water made available by a federally financed dam. 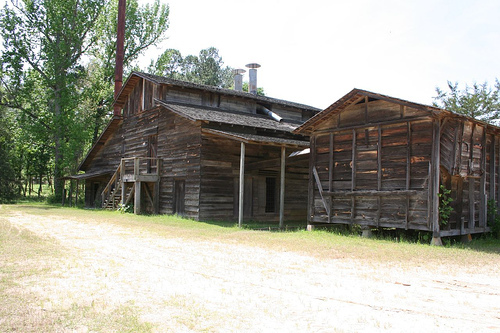 The abandoned share cropper house means a mechanical picker will harvest the cotton. Cotton was not king, the market was king. As cotton became less profitable, farmers tried other crops. In Penhook, several farmers banded together and formed a co-op to raise and ship cantaloupes The framers built a packing shed where the fruit could be sorted, packed, and shipped by rail to St Louis where an agent agreed to sell the cantaloupes. Cousin John said in 1937 they shipped an entire box car of cantaloupes. A week or so later they received the anxiously awaited letter from the St Louis agent. He informed the co-op members that the sale of the fruit did not cover the cost of shipping - they owed the rail company $14. In 1929 Grandpa Wilson controlled over a thousand bales of cotton and he had a bit of good luck, followed by some bad luck; as is often the case. Stuart Wilson, Grandpa's nephew and a banker in Texarkana was in New Orleans on a business trip and saw mountains of cotton bales waiting to be shipped to Europe or back east. Stuart immediately telegraphed Grandpa to sell all his cotton as quickly as possible. Grandpa did and a few months later cotton prices plummeted by 90%. The Great Depression arrived and Grandpa's luck turned sour. A bank had been formed in the heady days of the 1920's and the only brick building in Penhook was built to house it. Grandpa was invited to be the president; another gentleman would run the bank, as president was an honorary title, of so he thought, he accepted the position. The Bank of Penhook was one of the first casualties of the economic collapse. Grandpa discovered he was responsible for a pile of bad debts left by the insolvent bank. All the money he made in the cotton sale went to cover the banks bad loans. Somebody remarked to him that he had no money in the Bank of Penhook. He replied, "No, I never trusted that bank." He moved his mercantile business into the bank building and eventually paid off all the bank debts. Of course, he owned thousands of acres of farm land borrowers had mortgaged to secure loans, but land was almost worthless during the depression. One place he let go for taxes as, he said, there was nothing there but "a lot of big old pine trees." Mrs. White, who with her husband owned the telephone system in Penhook, told this story to me when she was in her eighties. She and here husband, Claude, were share croppers in the 1930's and one year when they settled up, their part of year's crop came to five dollars. The next day they attended church and the preacher delivered an emotional sermon about missionary work in China and the great need there. When they passed the collection plate, Claude put in a dollar. Mrs. White saw what he did and said, "You just as well put it all in. I can live on nothing as well as four dollars." Before DDT farmer controlled the boll weevil with applications of arsenic. One old-timer said as a child he refused to sprinkle arsenic on the cotton because, "It made my lips and hands swell up so I couldn't talk or lift nothing." When my brother purchased the old Middleburn store in the early 1970's, he discovered a barrel of arsenic in the store room. He didn't know what to do with the stuff, so there it sat. Eventually he closed the store and moved to Australia. I guess when the bull dozers flatten Penhook, they flattened the arsenic too. When DDT arrived it was usually applied at night or in the early morning when there was no wind. Mules pulled mechanical dusters down the rows of cotton. Neither man nor mule had any protection from the dust. Occasionally, a man might wrap a cloth over his mouth and nose, but that was about it. By 1957 very few farmers raised cotton. That year I had a summer job measuring cotton acreage in Hempstead county and only a few tracts exceeded ten acres. The only major growers were in the Red River Valley, where a farmer might have a thousand acres under cultivation. By the 1960's only these large cotton farms remained. 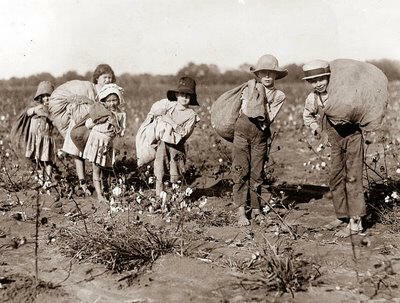 To the modern eye this looks like child abuse - barefoot kids forced to pick and tote bags of cotton. But the old folks say the children they were never sick and they only complained about the bolls cutting their hands. We can take it for granted there was no such thing as child obesity.